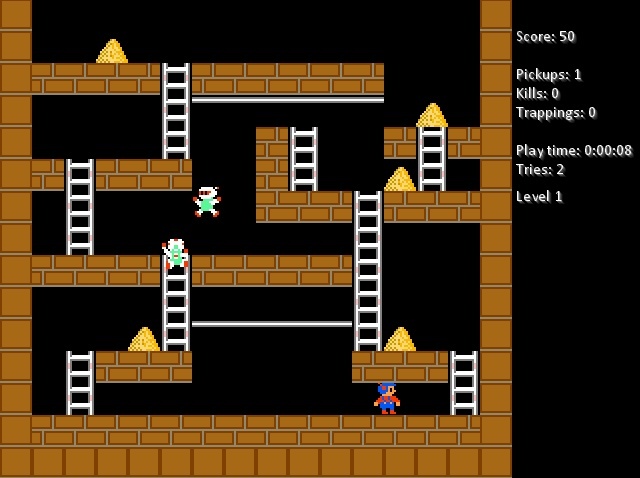 Lode Runner PGS II is an open-source remake of Nintendo's 8-bit Lode Runner game version (by Broderbund). NOTE: This game is FANMADE and not connected with Broderbund or Nintendo or Hudson Soft in any way! Self-updatable - If new version is here, LRPGS will notify! Open-Source - See how the game works, modify as you like. Single player mode with story and possibly more objects. Collect all items (Gold in this version and skinnable in the full version) then go on THE TOP OF THE SCREEN. When LR level-sharing community be released you will be freely available to upload your levels there. Please be sure that you name levels with name in the form <number>.LRL. Example: 1.lrl, 2.lrl, 3.lrl, 4.lrl... and so on. The game source is in the form of Game Maker 6.1 document file, separated. To obtain the source, you have to download the game, extract it, then download this archive, and add its contents into the game folder. The code is not completely commented, but I hope it is still readable. Making the Single Player mode is great idea. If you want to contribute, contact me. Started 1995 when I was playing NES's Lode Runner and discovered the hidden level editor. I started drawing levels in notebooks and upon 2005 I was created six notebooks with levels. If you like this game, consider making a small donation (via PayPal). This way you will really support this project and all other my projects. You wil also support my education, and I will really thank to you in any way, including new and better varsions of this game.